August 22, 2018, 5:00 p.m.
Americans believe that democracy is the best system of government, but is it working here? Maybe not as well as it could. In the latest Economist/YouGov Poll, Republicans and Democrats have different ideas about how things are going. 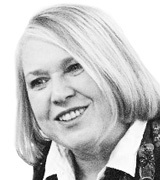 But they do agree that democracy is the best form of government, and by similar margins. There is some doubt among political independents, those unaffiliated with either party, and especially among young adults (those under the age of 30). It’s not that many disagree, it’s that sizable percentages say they aren’t sure. What Republicans and Democrats see in democracy today are different outcomes. 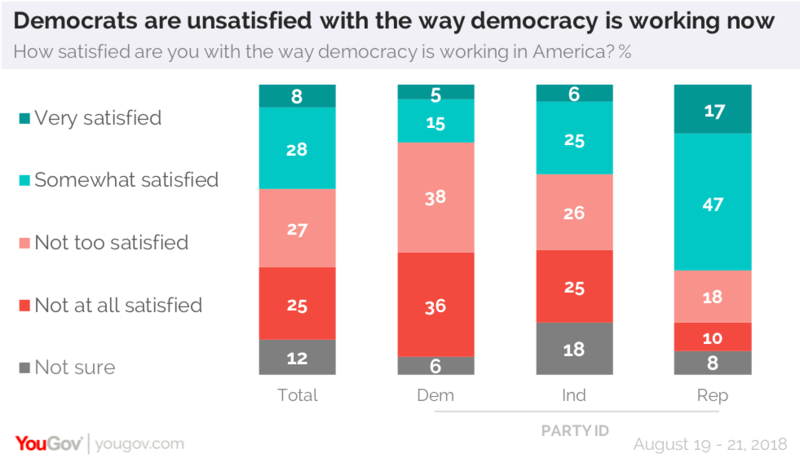 Republicans control the Presidency and Congress, so it’s no surprise that they are much more likely than Democrats to be satisfied with the way democracy is working in the United States today. The level of GOP satisfaction, however, is muted: just 17% of Republicans say they are “very” satisfied. 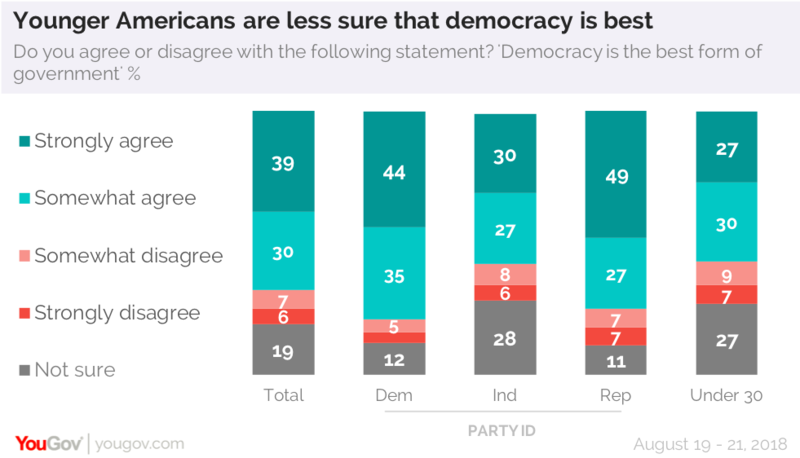 65% of Republicans believe democracy in the US works better than it does in other countries. Just 37% of Democrats agree. There isn’t a lot of happiness with Congress among those either party. Only 24% of Republicans approve of the way Congress is handling its job. Twice as many disapprove. (Among Democrats, the figures are 8% approve and 68% disapprove.) In contrast, President Trump’s approval rating with Republicans is 84%. 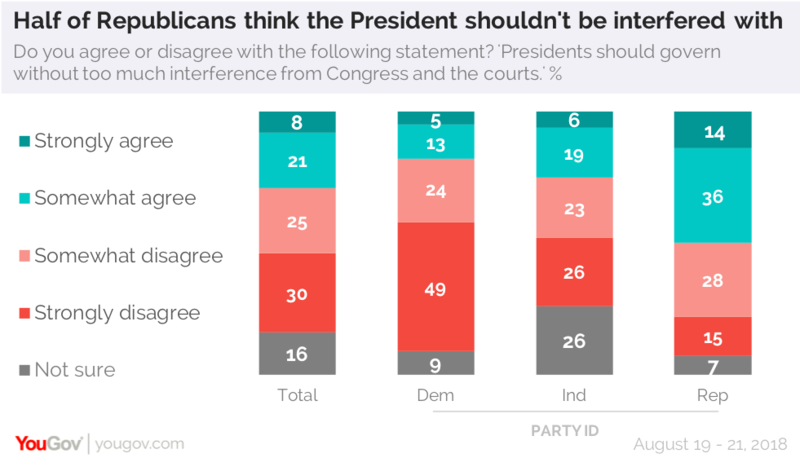 Many Republicans today would be happy to have the President take more control: by a margin of 50% to 43%, they agree the President should be able to govern without too much interference from Congress and the courts. The overall public disagrees. There are similarities between the parties. Asked about whether certain characteristics are important to a strong democracy, there were no partisan disagreements on the need for having open and free elections, or a system of checks and balances (though as noted above, half of Republicans would like the President to exert more authority). Republicans and Democrats also agree on the importance of protecting the rights of people with unpopular views. However, given partisan conflicts over what media are accurate, Republicans and Democrats assign different levels of importance to news organizations being able to criticize leaders. There are smaller party differences on the importance of the right to non-violent protests. Does President Trump respect the country’s democratic institutions? Many Americans aren’t sure he takes the same view they do. Half say he has little or no respect for democratic traditions and institutions. 40% say he has a great deal or a fair amount of respect. But answers to this question also depend on parties. More than eight in ten Republicans believe the President respects the country’s democratic institutions and traditions; more than eight in ten Democrats say he does not. Americans tend mostly to look backwards into history when they are asked their choice for the country’s best President. Abraham Lincoln is in first place with 17%; George Washington, Franklin Roosevelt and Ronald Reagan get double digit support. So does Barack Obama. The first African-American President is named as the country’s best President by a full half of all blacks in this poll. He is also the choice of 8% of whites. But many also view President Obama as one of the two worst Presidents in US history. The other is the current occupant of the White House. While many look back to find the best, it’s in the current partisan divisions where we see the worst. Three in four Democrats say President Trump is the worst President in history; two in three Republicans say that dubious distinction belongs to President Obama. Richard Nixon, the only President to have resigned, is far behind the two most recent men.